I talked with a friend recently about some pretty tough stuff she's going through. About disappointment, suffering, heartbreak. I couldn't fix it; I couldn't make the pain go away. All I could do was be there for her- be present for her-hold her hand. She told me she's been trying to let herself go through those emotions and just lean into what's happening. Not to let it all overwhelm her, destroy her, but also not to run away from the pain. The courage of that really struck me. Did you ever think about leaning into suffering? Most of us want to anesthetize suffering as fast as possible. So, here's the thing I thought about all week- When you try to teach and live with an open heart, there will be great moments of joy available to you. Your heart will fill with happiness. Sometimes it will physically feel like it might burst. 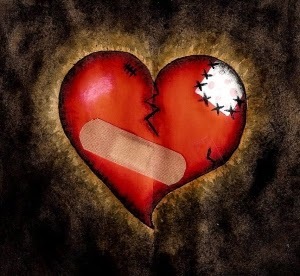 But.... when your heart is open, it will also be very sensitive to breaking and hurting. You can't have one without the other. It's the human condition- the yin and yang, the ups and downs, whatever you want to name it. So how do you deal with heartbreak in the classroom and your life? How do you deal with suffering? We all suffer; we all have heartbreak. We all don't talk about it a lot because we're a culture of, "Hi. How are you? Fine". We're too busy to talk about the tough stuff or too scared to talk about it. We feel vulnerable and that's not comfortable. Everyone likes happy people, right? "The next time you lose heart and you can't bear to experience what you're feeling, you might recall this instruction: change the way you see it and lean in. Instead of blaming our discomfort on outer circumstances or on our own weakness, we can choose to stay present and awake to our experience, not rejecting it, not grasping it, not buying the stories that we relentlessly tell ourselves. This is priceless advice that addresses the true cause of suffering- yours, mine, and that of all living beings." So, I went through the heartbreak. I dealt with all aspects of it. I didn't ignore it. I talked about it. I cried about it. I felt it. I leaned into it and I leaned on the people I count on. They were there for me. That's the other beautiful thing- if you ask, people will be there to witness your heartbreak. And, shared heartbreak is never ever as bad or painful as heartbreak you keep to yourself. So, I'm moving through it. I want to be clear here that I'm not talking about dwelling on unhappiness or feeling sorry for yourself. I'm not suggesting that you let something difficult overwhelm you to the point of paralysis. More just allowing yourself to feel the sadness- so that you can get to the other side. Allowing yourself that part of humanity. I had joy this week too- real joy. On the morning I was really down, I knew there was a good chance I would pass that gloom on to the children. So, during our morning meeting, I had them write sentences about some of their favorite things. Then they practiced their English with each other in a kind of musical chairs activity to the song "Happy". As we danced around the room, I noticed how my heart felt. Heartbreak and joy at the same time.....while dancing with middle schoolers from every part of the globe...Quite the feeling. "When you begin to touch your heart or let your heart be touched, you begin to discover that it's bottomless-that it doesn't have any resolution, that this heart is huge, vast, and limitless. You begin to discover how much warmth and gentleness is there, as well as how much space."